As a suburban kid raised in Mississippi, transit was never a priority to me or even on my radar. I lived in a society that was solely car dependent. It wasn’t until after college (2003) that I first experienced the value transit provides. My first job from college was as an urban planner in Princeton, NJ. This location afforded me the opportunity to frequently explore two of the best transit systems in the United States (Philadelphia and New York). Being new with little to do, I spent all my free time back and forth exploring New York and Philadelphia using all forms of urban transit. It was thrilling to be able to be so mobile and explore so many places without using a car! It was a quite an eye opening and life changing experience for a young boy from the South! Fast forward to 2004, when I moved to Nashville and the contrast was stark. The transit system in place in Nashville was an antiquated hub and spoke system with long wait times and was extremely difficult to navigate efficiently throughout the city. Nonetheless, I was determined to be a transit advocate and to both support transit with my ridership and be a voice in what the future transit vision could aspire to. In 2008, a group of like minded individuals from a local online design forum met at a local coffee shop to discuss transit and what could be done through a grassroots effort to advocate and support transit initiatives locally. This was the formation of Transit Now Nashville a non-profit whose mission was to engage the Nashville community to promote a vibrant transit system. Unbeknownst to us, our timing couldn’t have been better to impact Nashville’s transit future as Metro Nashville had begun to explore investments to transit. Understanding that a bold, long term transit plan was not in the city’s immediate future, we began by exploring what could be done to improve the existing system and would get people excited about the future potential. Through grants and individual funding, we were able to embark on many programming initiatives including ridership training, programming the first free circulator system The Music City Circuit , continued advocacy in transit initiatives like The AMP project and assisting with the long term strategic plan NMotion. 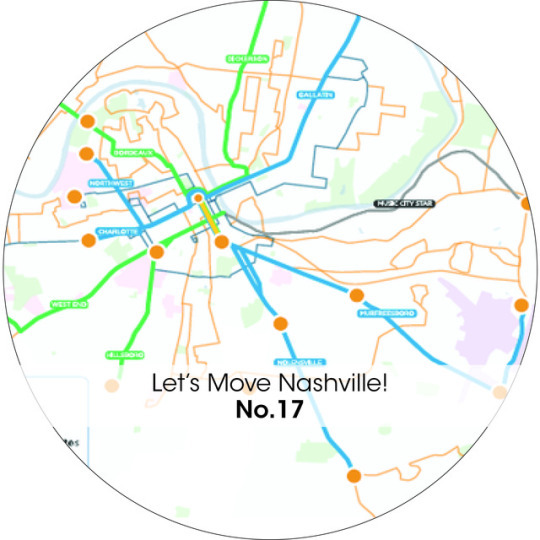 The NMotion plan created the framework for the current transit implementation plan Let’s Move Nashville. The plan (http://letsmovenashville.com/plan/) is the biggest, boldest transit initiative ever for the city of Nashville. It includes over 5.2 billion dollars of transit improvements including a downtown transit tunnel, 20+ miles of light rail transit, new rapid bus routes and comprehensive improvements to transit routes throughout the region. As Mayor Barry stated recently, As you sit in your car today remember that this is the best day of traffic you will experience , tomorrow it will be worse and the next day it will be worse……. Without bold action, everyone will suffer and Nashville will fall far behind its peer cities in the economic growth race. It is critical we act now and invest in our future. Without transit investment, job growth, employee retention, quality of life, job recruitment, tourism and overall economic growth will suffer. To fund this bold plan, the city will be hosting a city-wide voting referendum on May 1st 2018. I would kindly request that you actively get involved and let YOUR voice be heard. We are going to need all the help we can get to win this referendum and move forward. What can you do? Get involved today! Remember that today is the best day of traffic you will experience , tomorrow it will be worse and the next day it will be worse……. My daughter this icy morning riding the bus to the coffee shop with her friends.